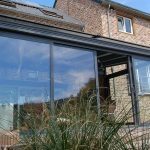 Our range of patio door products offers a diverse selection of external aluminium doors, giving you a complete solution whatever the size of your house or your outside space. Premium aluminium patio sliding, folding and hinged doors. 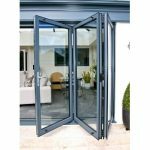 Led by our best-selling double glazed frameless slide and fold doors, all our patio door products provide exceptional style, maximum light transmission, peace-of-mind security and excellent energy saving properties. Choose from hinged, sliding, folding or a combination of opening options. 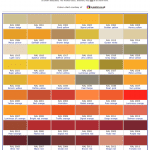 Extensive colour options, flexible opening inside or out, a choice of door panels and quality glass units make our patio doors ideal as a replacement for your old doors or as part of your new extension. 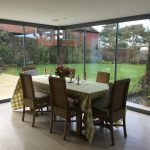 You can also choose between our sophisticated frameless patio doors or our full-framed versions. 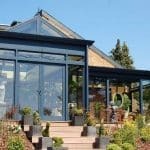 If you are looking for a new patio door for your home, we are confident no other company offers our choice or quality. We professionally install our doors all over the UK, promising enjoyment with reliability and high performance all year round. Contact us today for a free, no-obligation quotation and to discuss your requirements with one of our trained, friendly staff.